Rig 1 - KL50T. 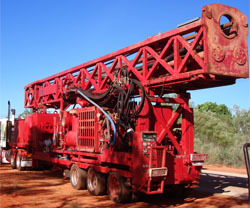 Custom built multi-purpose top head drive drill rig. 13m mast rated at 70 tonne pull back and fitted with dump system. Retractable drive head with 8" bore rated at 20k NM. Caterpillar 525HP engine coupled via clutch to onboard compressor (900cfm x 350psi) together with hydraulically driven triplex water pump and duplex mud pump. Rig is mounted on triaxle drop deck trailer with 4500 litre fuel and oil tanks. Drilling Rig 2 Hydco 700w. Manual 8 x 8 flat-top with 7000 litre tank and 8 tonne knuckle crane. Manual 8 x 8 with 2 x 2200 litre tank, 1800 litre fuel and oil tanks and 8 tonne knuckle crane. Manual 8 x 8 tray top with 7 tonne knuckle crane. Plus 3 x 12 triaxle semi trailers. Sullair 350psi x 900cfm skid mounted. N5 NPS300 4 x 4 crew with tray. Fully equipped with kitchen, laundry and ablutions. 4 x 4 tray top.